As dogs are human’s best friend, people tend to choose the best for them as great outdoor play space, and you can do this by choosing artificial grass. By the way, the best fake grass for dogs is people friendly too. A specialized grass for dogs makes a gorgeous outdoor living for all members of a family. 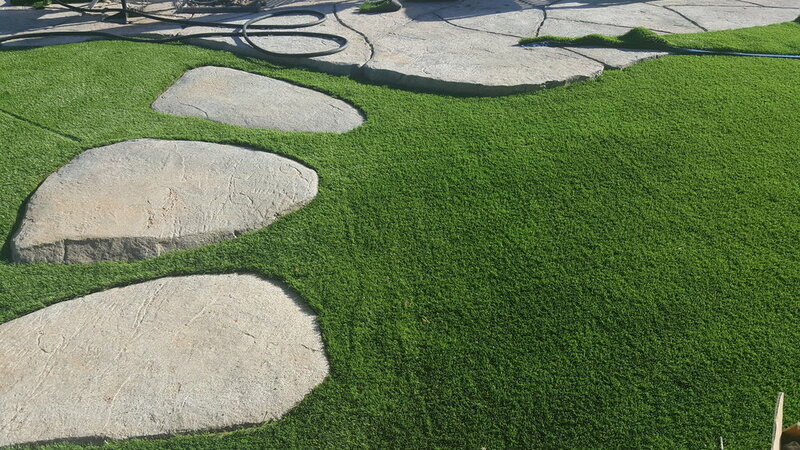 The artificial grass is easy to maintain as there is no mowing, and all that other work required by the natural grass. You can save your money and time and yet results will look much better. Even cleaning the dog’s excrement is easy. It’s also clean by nature, no trimmings, no dead spots or bare dirt that may create mess and mud. Fake grass is healthy as well because it’s not allergic and toxin free. It does not produce pollen that may trigger allergy in people or even your pets. It’s not a good environment for fleas, mosquitoes, ticks, mites or other pests that bother dogs and humans. Artificial grass for dogs is friendly to environment, as you will stop applying fertilizers, herbicides or pesticides to your yard. You do not have to waste water to keep a grass alive, and it is very good to know that after many years, artificial grass is fully recyclable. It’s tough and in the same time soft and comfortable, and dogs cannot dig holes in it, and it’s the best for dogs to be settled in the grass for a snooze. Most often dogs go out on a leash, especially when their homes are not fully fenced, they are limited to sidewalks, and you have to drive them to a dog park. This feels like a prison and dogs can’t have fun this way. However, once you install artificial turf, dogs will never have to leave home to get exercises they need. This does not mean that you do not have to take them out for a walk or hike or even swim in the ocean, but this will make better conditions for your dogs to enjoy being at home, or doing their daily exercise. How to choose the right turf? There are many factors to consider when choosing the best type of turf for your dog area, like practicality, safety, comfort, maintenance, expense, and most importantly proper drainage. Normally dogs like soft grassy play areas, artificial grass is best for them to make them feel comfortable, it’s perfect for pets and their friends because it’s designed mainly for dogs and dog owners. Also, it is safe for your dogs, family and for the environment. With artificial grass, you can have a wonderful yard and a happy dog. Moreover, it never needs water or chemicals, there are no muddy paws, dog urine drain right away, and it dries fast. Fake grass is thick but also soft to the touch, it rinses away waste, there is no discoloration or stains and it withstands the most rigorous play time. Active or busy dogs normally turn the natural lawn into a mess; however, fake grass for dogs reduces the ugly patches, holes and spots. Give your dog a comfortable play area, and give yourself a break with the fake grass that is relatively maintenance free.